These prices are reflective of overall project cost. Please call for more information on pricing for your project. Nancy has great ideas and is easy to work with. She is very detail-oriented and any issues (and there are always some issues!) are handled quickly and professionally. We recommend her most highly. And her sense of humor makes her fun to work with! When I first called upon Nancy for what I thought would be a little help in designing my new apartment, little did I know that months of intense collaboration would ensue. It’s been quite a ride. Nancy is talented, resourceful, and wonderfully patient..the voice of reason in the maddening world of renovation. No one works harder or makes herself available at any hour more than this amazing pro. Add to that the fact that she is great fun to work with..you can’t do better. Nancy is a true professional interior designer. She listens and incorporates her ideas with your taste in design. She has very good resources and doesn't object to using her customers resources. Excellent follow up regarding orders.and is very considerate to your budget. Nancy helped me with an upholstery project and I couldn’t be happier w the results. She knew exactly what I was looking for and went the extra mile to find the best samples and an affordable vendor. I will use her services again for sure. I worked with Nancy on a complete redesign of my master bedroom. I had never worked with a designer before and was a bit intimidated with the whole process, but Nancy was amazing at every step. She spent time getting to know me and what I was looking for. She took time to educate me about the design process and at every step offered me reassuring guidance and inspiration. I could not imagine a better first time experience with working with a designer. Nancy was the consummate professional...and super fun to work with as well. I always looked forward to our meet-ups....and I have a phenomenal master bedroom too! Thank you Regina! I loved working with you and think that we able to transform your bedroom from ordinary to super beautiful extraordinary! We also had fun along the way! Hope to collaborate again soon! I hired Nancy for an extensive renovation of my very expensive condominium apartment that required craftsmen from multiple specialties. Nancy not only found the most qualified companies, but she was able to coordinate all work from beginning to end. She was also extremely flexible and happy to work with me, even though I had very specific ideas on decorating that could have easily been uncomfortable. The apartment is now beautiful and has far exceeded my expectations. An excellent job! Thank you Alan! It was a pleasure to work with you on this project. You were a "dream client" with great taste and style. I think the apartment looks fantastic and is a huge departure from how it started! Thank you for the opportunity to work with you! We worked with Nancy on our home renovation. She was a great partner, super responsive, professional, flexible with scheduling (which is so great as I was very pregnant with #2), and worked within our budget. She has a keen eye for design and played such a critical role in all of the decisions we made. 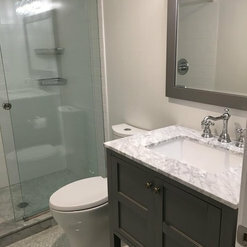 With so many options to choose from for everything - tiling, hardware, bath/kitchen hardware, sinks, vanities, lighting, paint etc - Nancy made it so much easier to narrow down and make a final decision. She was an amazing resource. It was also so great to feel like someone was on your side. She didn't force us to spend more than we budgeted for, but would let us know where she felt spending more would go farther which was truly appreciated. My husband and I also like VERY simple designs, however, she was great at pushing our boundaries a bit to make the home look and feel that much more "elevated" in style. Thanks so much, Nancy! We love our home. Thank you Karen! 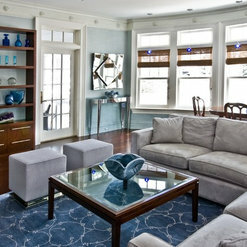 I enjoyed working with you and Mike on personalizing your lovely home. I think the kitchen came out great and now feels like an appropriate match to the rest of the house. I like how fresh and clean the bathrooms are and I also love the lighting that we selected throughout the home. Wishing you and the family many years of health and happiness in your beautiful home!! Nancy exceeded expectations in every way. 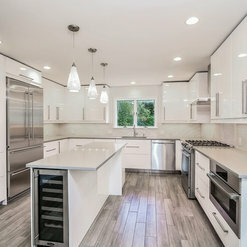 I am skeptical of designers and was hesitant to use one for a kitchen remodel that I just completed. I was worried about the cost and getting pushed in a direction that didn't work for me. From the beginning it was clear that Nancy was a great match, she listened well, she has amazing design instincts and she adapted well to our personal style. I ended up with a kitchen that feels like my own ideas, but expressed in a way that I never would have been able to come up with on my own. Nancy has great relationships in the industry and I think she ended up saving me more money than she charged. I price checked on numerous occasions online and at other stores and never managed to be able to find a better price than the discounts she got us in various stores and in the case of the quartz countertops (biggest purchase we made) her connection came in 40% lower than a quote from a friend who is in the industry and has great relationships, unbelievable! The quality of the work from everyone she recommended was excellent including taking returns on one item that was clearly stated as being non-returnable. Nancy is a rare combination of design talent, consistent focus on client tastes and never losing sight of cost vs. value. Overall I couldn't have asked for a better outcome and will be working with her again on my next remodeling project. 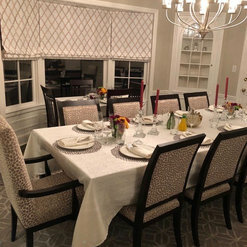 Despite the fact that my project was a smaller scale than her other clients, Nancy of ND Interiors listened and worked with me in the same way I’m sure she does with her larger project clients. She gave me the time, ideas and support to make my dream bedroom become a reality. I look forward to working with her again in the future. I had the pleasure of working with Nancy of ND Interiors on a project to decorate our dining room and entry way. Nancy listened carefully to what I was looking for and thoughtfully considered how best to achieve our design goals within the specified budget. She quickly grasped my personal style and was able to translate that into furniture suggestions that worked beautifully in our nearly 100-year-old colonial home. 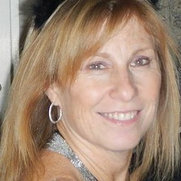 Nancy is generous with her time, very responsive and always willing to search for the best price to stick to budget. She willingly proposes where trade offs can be made on price without compromising overall look and quality. Although our project started with just two rooms of the home, I decided to expand our work together to also include finishing our master bedroom - and I'm eager to start other projects with Nancy soon. Thank you Emily! 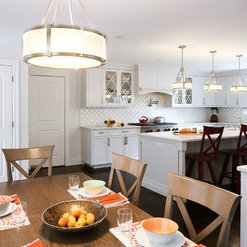 You are a pleasure to to work with and I LOVE the way the dining room and foyer came together. They are really beautiful. As I think you know, your bedroom is one of my all time favorites!!! I could look at your drapery all day (and night) long! I hope we will get to tackle your living room in the near future! Nancy is such a pleasure to work with, professional and great at what she does! 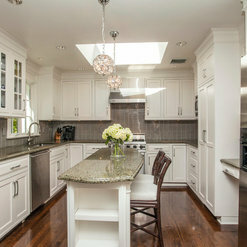 The kitchen she designed was spectacular!! I look forward to our next project together. Working with Lisa and the team at Walker Zanger is a real pleasure. 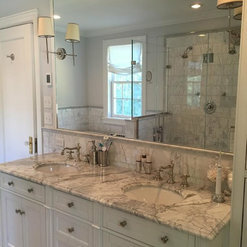 They are very knowledgeable about their products and it goes without saying that their tile, stone and slabs are top notch. Nancy is a true professional with great talent and passion for what she does. 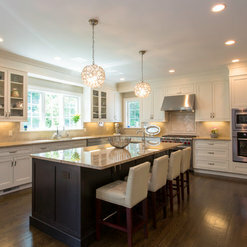 Her attention to detail, beautiful vision and design ideas as well as her understanding of the clients' needs helped bring to life many fantastic projects. She is an absolute pleasure to work with! I would highly recommend ND Interiors as your destination for all interior design needs. Thank you Ashley! Having you and Wayfair as a partner in design is fantastic! We are able to source so many fantastic products at all different price points which keeps my clients very happy!